Do you have streaking —cloudy, uneven patterns —on the surface of your natural stone floors? This article explains the causes of streaking and what you can do to get rid of it. Sometimes, in an effort to be efficient, homeowners or cleaning and janitorial service workers fail to change mop water often enough. The result is that dirt, grime, and contaminants get spread around rather than eliminated. The solution? Damp mop (rather than wet mop) and change the mop water as soon as it no longer looks clear for streak free floors. If the streaks still appear, try buffing the floor with a white nylon pad. When it comes to floor cleaning solutions, there are many cleaners to choose from, but only a few of them are safe and effective for cleaning natural stone floors. Sometimes when floors are very dirty, it is tempting to use more than the recommended amount of cleaner. Using the wrong cleaners or the right cleaners in the wrong amounts can result in streaks. The solution? 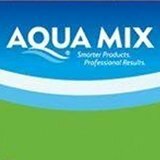 Be sure to select a stone safe cleaner or stone soap and use the recommended ratio of cleaning solution to water for streak free floors. Again, if you re-mop the floor and the streaks still appear, try buffing the floor with a white nylon pad. Although there may be certain circumstances where waxes or coatings are necessary, it is best to have your natural stone floors honed and/or polished to a beautiful, natural shine. However, if waxes and coatings are necessary, they must be applied properly. If your marble, limestone, granite, travertine, or other natural stone floor is streaked because of a build up of waxes or coatings, then the floors must be stripped. 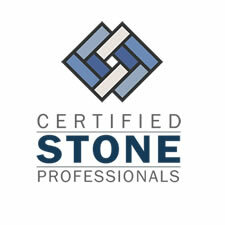 We highly recommend you have a professional stone restoration contractor perform this service for you, however, if you must do it yourself, be sure to use a commercial wax stripper. Sometimes etching, scratches, or dullness from foot traffic can be mistaken for streaking. If you are unable to get rid of streaking on your natural stone floor, perhaps it isn’t streaking at all. 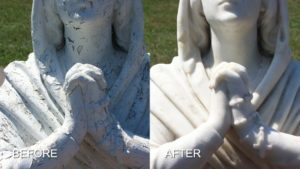 A clear, beautiful, reflective finish can be achieved with professional stone restoration services.